In the next exciting installment in the Modern Library Reading Challenge, our intrepid reader tackles John Fowles’s The Magus! We both smiled, and we both knew we smiled to hide a fundamental truth: that we could not trust each other one inch. 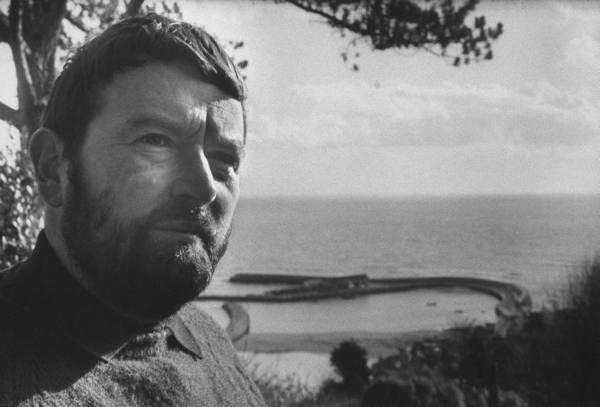 11 October 1963 It enrages [Elizabeth Whitton, Fowles’s wife] that my priority isn’t the getting of a house, it enrages me that her priority isn’t giving me the time (or peace) to finish The Magus. So we live at cross-purposes. Fowles began work on The Magus (originally titled The Godgame) when he was 28, and then dropped the project for ten years. One quotation Fowles relied on during the writing of The Magus was from Henri Alain-Fournier’s Le Grand Meaulnes: “I like the marvelous only when it is strictly enveloped in reality.” And yet the one thing distinct about The Magus is the frequent lack of reality. We are asked to believe that Nicholas, a learned man, would not conduct some serious research into Maurice Conchis, the apparent World War II veteran who charms Nicholas into his manipulative world, after so many inconsistent stories. (To cite just one example, if you are a young and self-absorbed man with poetic aspirations and a man tells you, “Words are for facts. Not fiction,” would you not doubt him?) Nicholas does look into Conchis and his ostensible associates eventually, but only after the terrain has shifted into the ridiculous, with Nazi reenactments and implausible impersonations. 27 May 1964. I cut everything that stands in the way of the narrative thrust; anything that lapses beneath a certain state of tension. Because this seems to me the essence of the novel — the exact harmony between subject-matter (symbolisms, intellectual and stylistic aims) and narrative force (simple old readability). The words on a page have got to life it over. Narrative is a sort of magnetism. When Nicholas tells Alison, the purported paramour whom he proceeds to treat like dirt, about the tricks that Conchis has been up to, he says, “It’s not that I believe any of these things in the way he tries to make me believe them….It’s simply that when I’m with him I feel he does have access to some kind of power.” And yet Conchis’s magnetism is clearly a load of bunk. When a man you confuse with “an Elizabethan nobleman” sends you a note not to come around again shortly after you have had to cut yourself free from German soldiers who have tied you up (and where did they come from by the way? ), only to send you another message through his courtesan, surely there is a point in which you realize your homemade cork needle isn’t bobbing the way that you hoped. She stubbed the cigarette out and sat back. Of Anthony Burgess, Fowles was to write in his journal: “It is a mistake when fine minds wear a mask of plebeian coarseness to excuse themselves, even truth can’t pardon that.” I can’t help but feel this way about Fowles, a novelist who preferred the company of readers over critics and who, for a time, received the twin triumphs of unmitigated sales and critical acclaim. But stacked against Jean Rhys’s pith and Iris Murdoch’s layered comedy, for me, The Magus was the reading equivalent to watching an untrained wrestler without confidence attempt to fight himself. It’s very possible that I was a tad too old to read this book. For many, I suppose The Magus is a bit like Zen and the Art of Motorcycle Maintenance. But I’m certain there were other stumbling blocks having little to do with the philosophy. Self-described centathlete Michael Menche, also working his way through the Modern Library, observed that Fowles shares a quality with Herman Hesse: namely, an inability or unwillingness to make the reader laugh. Novels, even much more lucidly conceived and controlled ones than this, are not like crossword puzzles, with one unique set of correct answers behind the clues — an analogy (“Dear Mr. Fowles, Please explain the real significance of…”) I sometimes despair of ever extirpating from the contemporary student mind. Next Up: William Kennedy’s Ironweed! You and I – definitely too old for The Magus. I enjoyed it, but thought it silly- I read it at the beach one week. The Hesse comparison is apt– both young people books. Mention of Hesse and his appeal to youth brings to mind that this is appeal happens to be peculiar. Steppenwolf, for example, became quite a hit with young people in the ’60s. But it is, in fact, a book about a man having a mid-life crisis. A fascinating piece which raises lots of questions and makes me want to read The Magus, though I’m not quite sure I will. I certainly know some terribly self-absorbed people, but it’s very hard to create such characters without an element of caricature. And having written several open-ended novels, I often wonder what it is about myself that dislikes resolution. They don’t exist outwith the sentences that embody them. Having just finished reading The Magus, I have to take issue with the thought that this is “a young person’s book”. This, I feel, is nothing but arrogant condescension, made from the transparently false position of those wishing themselves to feel morally superior to the book – and probably the central character! The story is compelling and one that a mature audience would also appreciate – having been young once themselves of course! Yes, Nicholas is the anti-hero par excellence; a petulant child. But this fact is clearly by design and something I imagine the reader has to accept, if they are to make it through to the denouement. Indeed, the author prefaces the final scene with the explanation that this article craves: why no neat, everything-tied-in-a-bow little ending? I recommend that you read the start of chapter 78 if you actually wish to discover the answer to this “riddle”. It’s a good book, if you’re willing to consider it aesthetically rather than morally (that is another reference to the story by the way). In response to Kevin’s comments that this book is for both young and old audiences (i.e. Paula’s comment: definitely too old for The Magus), I would add my agreement with Paula, and my disagreement with Kevin. I am of an advanced age, and once upon a time I could have been mistaken for Nicholas myself. Thinking back over my earlier self, I can see how this book would have been a fascinating read at the age of 20-30. Now, however, it seems rather banal and self-absorbed. The author is a fine craftsman of words and sentences, but as for content and meaning, I found it to be lacking. Never the less, I was sucked in to the text, and felt compelled to continue to the ending. There is no God, and it’s not a game. Nicks fails to see, continues to tread heavily, breaking and hurting that which is precious to him, remaining attached to his desire, losing everything. This isn’t a unhappy romance; it’s a spiritual journey.